Unfortunately, the dress you are looking for (Style: BLH-DP1522, Name: BLH-DP1522) is no longer available. This floral-print v-neck jumpsuit is an ideal way to look cool and confident at a variety of events. Crafted from a light and airy chiffon, this long casual jumpsuit is a beautiful look for cruises, family celebrations, or outdoor wedding ceremonies. 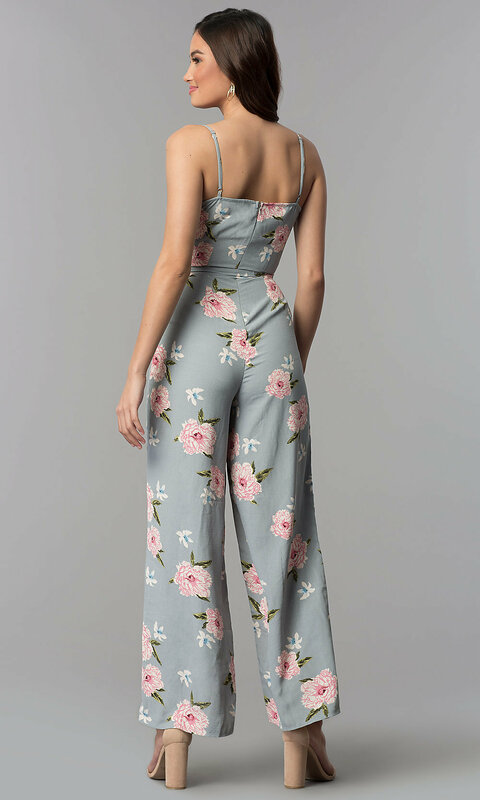 The adorable pink and white floral blossoms complement the silver gray background on the fashion-forward jumpsuit. Adding to the irresistibly girly vibe, this ultra-cute long jumpsuit is adorned with a bow tie sash at the natural waistline. Thin adjustable spaghetti straps support the v-neck bodice and ensure a secure fit, while convenient side pockets provide a place to stash your valuables as you enjoy the festivities. Let this floral-print v-neck jumpsuit with pockets be a unique addition to your wardrobe this party season.